I wanted to test some cheap load cells but I didn’t have a dedicated instrumentation amplifier (IA) therefore I made a small PCB for the occasion. 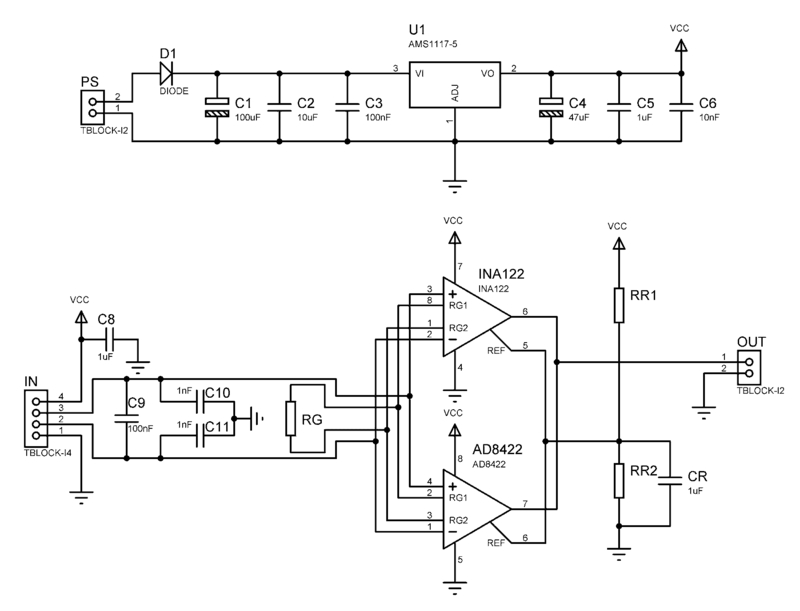 The schematic is very simple and allows me to use the PCB with two different single supply IA – INA122 or AD8422. 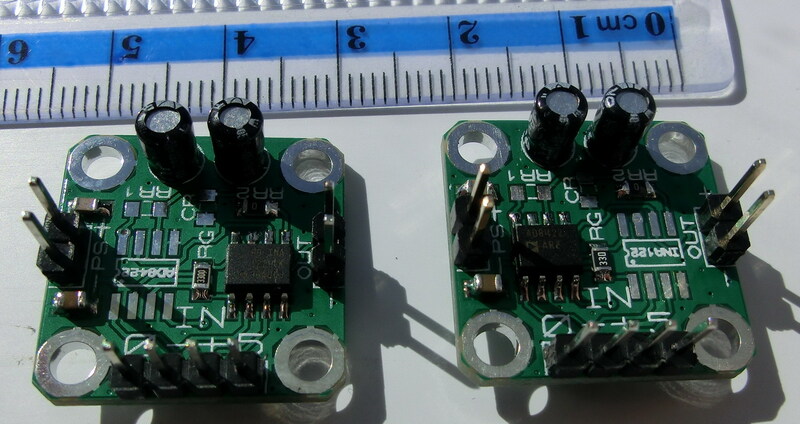 The power supply is a simple AMS1117-5V Low-dropout regulator with some decoupling capacitors and a diode for simple reverse connection protection. Both IA are Rail-to-Rail, single or dual power supply instrumentation amplifiers, however with different standard pin-outs. The gain is set by RG. RR1 and RR2 and CR form a voltage divider that could be used to offset the output signal. 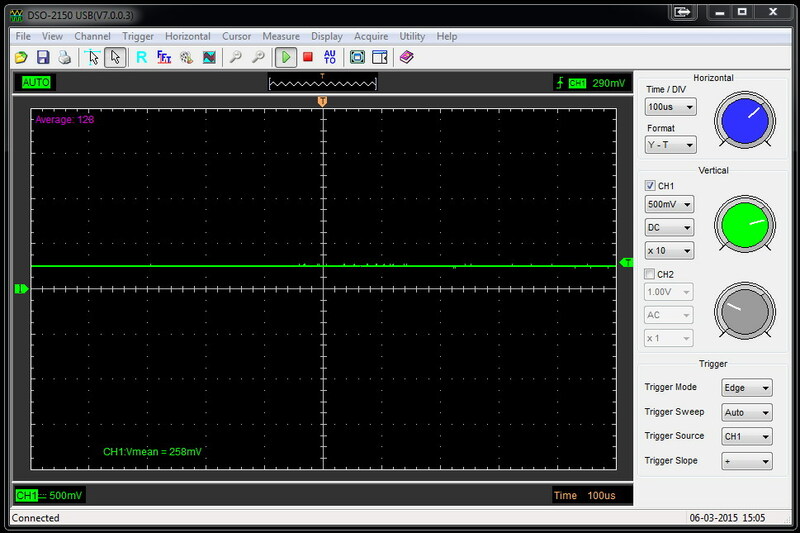 If no output level shift is desired then RR1 and CR should be omitted and RR2 should be a 0R resistor. 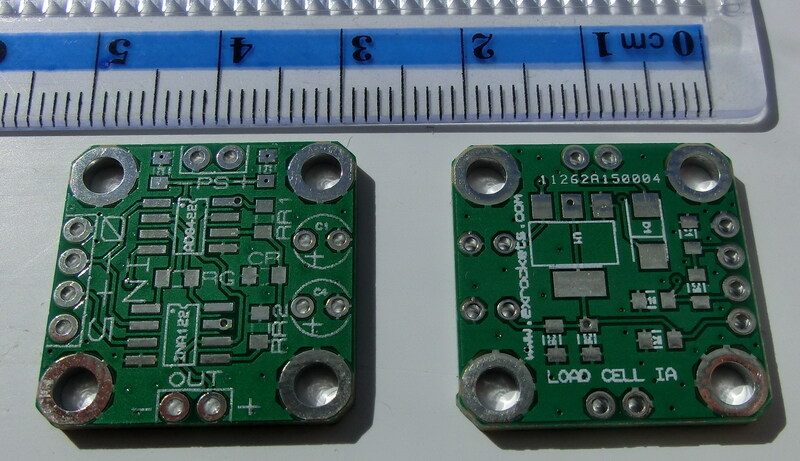 The PCB was designed for using small outline ICs and SMD components so the total size is 22×22 mm, including four 3mm mounting holes. Finally I tested both IAs, connecting a cheap 10kg load cell from Ebay. The gain was set to 600 for AD8422 and 611 for INA122, as power source I used a standard 9v battery. So as you can see everything works well and as expected. An interesting observation is how close to the rail can get the INA122 output. In fact the output of INA122 is only 7.8mV from the rail whereas the AD8422 output is 48.4mV from the rail, which confirms my previous experience with the INA122 amplifiers, nevertheless both amplifiers are excellent single supply Rail-to-Rail instrumentation amplifiers.